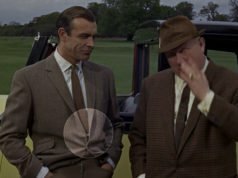 The exact cloth of Sean Connery’s blue suit in Goldfinger and Woman of Straw is a difficult one to make out. It’s a heavy cloth and has a mottled appearance, so it’s certainly a woollen. But is it tweed or flannel? It has a subtle stripe effect that suggests the cloth is woven in a herringbone weave, so I thought it could be a herringbone tweed. But in herringbone tweeds the weave is well-defined and easy to see. In a woollen flannel, however, the nap mostly obscures the weave, which is the case with Connery’s blue suit. So, could it be herringbone flannel? I never saw or even heard of herringbone flannel until a reader of The Suits of James Bond who is a fan of the Connery Bond suits found a Fox Brothers herringbone flannel cloth in his search for a cloth to replicate the blue suit. 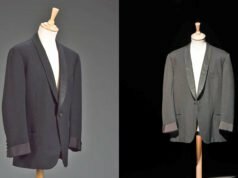 Fox Brothers is one of England’s most well-known manufacturers of flannel, and their Char Blue Herringbone Jacketing flannel is a close match to what Connery’s blue suit in Goldfinger is made of. The cloth is a 500/530 gram or 18 oz weight and is featured under Fox’s jacketing range. It is based on a cloth from the 1930s, when practically all suits were made from heavier cloths than what most suits are made from today. Though it’s labelled a jacketing, it makes a good suiting for cold weather. It would have been a more typical weight for a winter suit in the 1960s when Connery wore his suit. Connery’s blue suit indeed looks to be quite heavy, especially compared to his usual lightweight worsteds. However, I’d guess that Connery’s suit is made from a cloth slightly lighter than this one. The herringbone pattern on Connery’s suit looks larger than this cloth’s pattern, and his suit is a richer blue than Fox’s char blue. Whilst it may not be a perfect match, it is the closest I’ve seen to Connery’s suit and gives insight to what Connery’s suit is likely made of. The Fox Brothers cloth is code FS405 B2237/84 and can be purchased online at The Merchant Fox. Wow. I’ve been to The Fox’s factory in Wellington which is just down the road from me. They had lots of pictures of famous clients (Churchill, Cary Grant) in their lobby but no pics of Bond, I’d have flipped out if they had! In fact we interviewed Douglas Cordeaux, the owner, for this documentary (link below) where he shows us around his factory. Hope this is is some use to someone! Difficult to see in the photo. Does this suit have swelled edges? Was ever seemed flannel to me. One of my favourites Bond’suit. Film is considered an archive format and can be rescanned at different resolutions with more detail extracted as the resolution increases. Currently, the Bond catalog has been digitized at 2K for the restoration that lead to the Blu-Ray releases. Oh, how we exclaimed such surprise when we could see skin pores and texture on fabric in Dr. No! It was too cost prohibitive to scan to 4K at the time (so say my buddy at Sony who was involved in the deal). With 4K displays coming to the home in the next couple of years, there will be demand for 4K content. More scanning means the cost will come down and there will be a financial motivation to rescan all the Bond films to 4K (with 8K or 16k coming down the pike next, thanks to our friends in Japan). The problem is Skyfall. It was shot digitally at 2K. You can’t extract any more detail. It’s the same as resizing a digital photo to a larger pixel count. It just gets soft. This is what they did for the IMAX release and got away with it. So, some years in the future when we’re all buying Bond in 4K or higher, Skyfall will have the worst quality, from a technical standpoint. The post you’ve quoted isn’t quite accurate. Dr. No, From Russia With Love, Goldfinger, Thunderball, You Only Live Twice, Diamonds Are Forever, On Her Majesty’s Secret Service and Live and Let Die. The rest were at 2K. 8K scans will unlikely yield more information as the first three Bond films were made on (relative) modest budgets and had fairly flat lighting. Additionally the lenses, cameras and film stock used would have an overall effect too. Thunderball was the first one considered to use a large budget and made use of improved lighting and cameras (and lenses). My understanding, from friends in the film business, is that 35mm film projected in a theatre has a clarity equivalent to about 4K. This was evident to me when I saw From Russia with Love and Goldfinger at my revival house. Even an older, worn print showed more detail than a Bluray. The Blurays have great detail, as do 2K (roughly double the clarity of a Bluray on a fully HD TV) theatre presentations. But to see an actual film copy – wow. 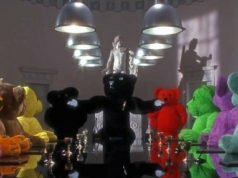 I’ve probably seen Goldfinger 20 times since I was a kid and it’s cemented in my memory, but I was blown away by all the little details I could see in the theatre that I never noticed before. 35mm film has a rough equivalent of 3.5k when scanned – but the ASA film speed along with the quality of said filmstock will play significantly into whether you will gain additional detail or begin blowing up the natural film grain of the stock. Like it or not, some of the cinematographic techniques used in the first three films do make occasional concessions to quality – more so a case of Ted Moore being set in his workflow than a deliberate attempt at being cheap (nowhere more evident than in Thunderball). Nevertheless, this has resulted in a number of scenes in these films shot with filmstock of a higher ASA than would have been necessary, had better lighting or a faster lens been utilized for the same shot. Higher ASA film speed = more film grain – and the first four films (all Ted Moore’s cinematography) have a lot of it. You can filter a finite amount of this grain out in post correction, but sometimes you can’t get rid of it all – neither do you want to; a certain amount of film grain is desirable and natural. However, when you have a dimly-lit scene where Connery’s facial features are awash in alternating noise patterns – well, you’ll never get rid of that. If brought up to 4K, these films will hold together (as will Skyfall – if they got away up-resing it to IMAX 7K, they’ll get away with selling the public an up-resed 4K print). Some shots will be very grainy, and some may receive additional restoration. While a 4K print may be large enough for Matt to determine the actual size of the herringbone, the grain of the filmstock may continue to prevent an absolutely positive identification of the fabric. You could be right. I’m no expert on this, so I can’t say much else, except that so far we’ve seen the films on Blu-ray in 2K resolution. There was a debate on that message board that followed, so you can look it up by googling the quoted post. All I can say is – we shall see what we’ll get. Was the historical use of heavier cloth for suits limited to England and other cool climates? Were Italian suits similarly heavier, and Italians sweating a lot? Was comparatively heavier cloth used for summer suits? I’ve always thought people wore a lot of clothes back in the day. I know that English and American suits were historically made of heavier cloths than suits are today, and everything is lighter now. I’m not sure what the Italians historically wore. Perhaps Carmelo knows. It’s a pinstripe flannel. I make men’s clothes. The stripe effect is most likely from a herringbone weave, as I explained. I do not see any pinstripes.